This project passed the test! When I showed it to my daughters, they both asked me to make them one with their names for their bedrooms. Impressing teenage girls is the most difficult thing to do! I used thin cardboard coasters for the back pieces. I covered them with Stampin' Up! 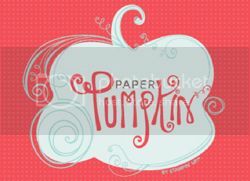 's "Sweet Pea" Designer Series Paper Pack, and attached them at the corners with Mod Podge. The "h e l l o" are chipboard letters that I painted with Stampin' Up! 's craft ink in Rose Red. I adhered the letters to the coasters with Mod Podge. 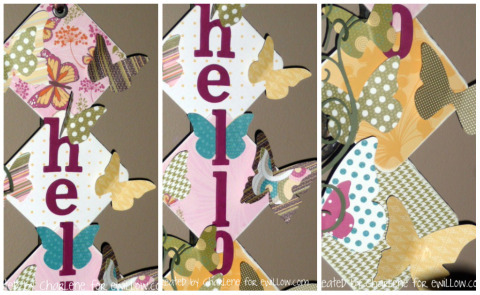 I used my Sizzix Big Shot machine to die cut the butterflies (Stampin Up! 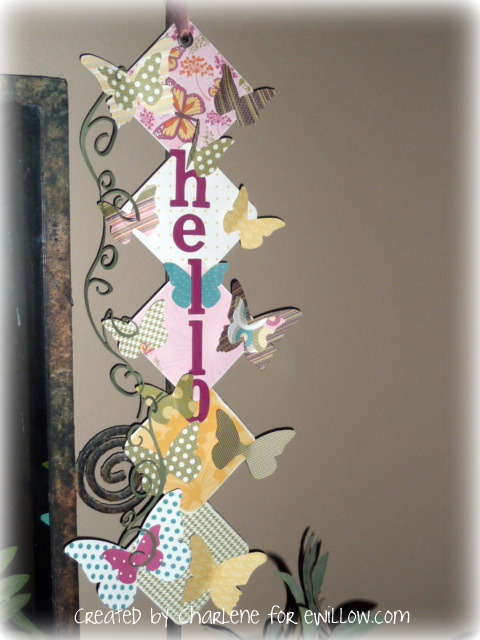 's "Beautiful Butterflies" Bigz Die) and the thin green vine (Sizzlits "Swirly" Decorative Strip Die.) Once again, I used Mod Podge to adhere everything, but as you can see, I only adhered parts of the butterflies and vine so they would be 3-D. I topped it off with a large brad and some ribbon for hanging.